What factors define the boundaries of an ecosystem? And how are boundaries modified by environmental change? We are investigating the abiotic and biotic controls on the upland boundary of coastal marsh, an ecosystem on the move due to sea level rise. Using transplant and caging experiments, we are investigating factors of salinity stress, light competition, dispersal limitation, and herbivory, which affect the recruitment and survival of wetland foundation species in coastal forest in the Mid-Atlantic. Much of this work is being done at Blackwater National Wildlife Refuge, where standing-dead tree skeletons, collectively referred to as a “ghost forest,” are a testament to the rapid rate of marsh migration and landscape change. Parramore Island, VA, viewed from a back-barrier marsh. Sea level rise can change the profile, footprint, and location of barrier islands, effects that may translate to the ecology and functioning of back-barrier habitats. In recent decades, some barrier islands are rolling landward at a rapid pace of geomorphic change, whereas other islands are more stable or stabilized through shoreline armoring and beach nourishment. We are studying the back-barrier habitats of stable and migrating systems to understand the coupling between barrier islands and the ecosystem services of their back-barrier habitats. For this project, we are focused on the ecosystem services of biodiversity, as a measure of habitat quality, and blue carbon storage in back-barrier habitats of the Mid-Atlantic coastal bays. Is this Spartina patens growing in a cornfield? 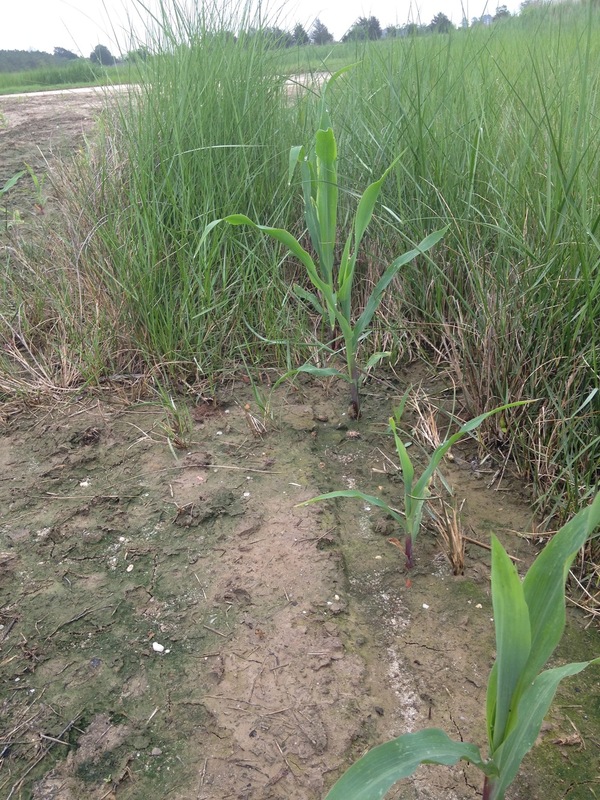 Or is it corn in a Spartina patens marsh? Due to sea level rise, tidal marshes are migrating onshore into natural and human dominated uplands. With our collaborators at the Agroecology Lab, we are investigating changes in plant community composition and biogeochemistry that come from saltwater intrusion into active and abandoned croplands, many of which have accrued a substantial fertilizer legacy. We are working with farmer partners to monitor this land use transition and study the assembly of these disturbed, often invasive species-dominated, and nutrient-rich ecological communities. Verbascum phlomoides, orange mullein, a widespread invasive species in North America. Photo taken at the Harewood estate in Jefferson County, WV. Introduced species can partner in mutualism with native species in their new range. These novel partnerships give a unique opportunity to study species interactions that lack co-evolutionary history and provide insight into how species interactions form and take shape. With colleagues Ben Sikes and Clare Aslan, the Gedan lab is investigating the role of environmental stress in the formation of such novel mutualisms. Our working hypothesis is that environmental stress should increase the relative fitness benefits of individuals that partner in mutualisms to offset the stress. Incipient, or novel, mutualisms between non-native and native species should be promoted at high stress, and should be under no selection, or selected against if they are physiologically costly, at low stress. We are testing this hypothesis in a variety of environmental stress gradients and study systems.